When people have a medical question, they schedule an appointment to see their doctor. Palo Alto, California-based HealthTap aims to change that. The company’s free web and mobile applications enable 24/7 access to personalized, relevant and trusted health information from thousands of leading doctors without leaving your home or office. At the HealthTap website, users post questions and doctors post brief answers. The service is free and the doctors aren’t paid. Instead, they are allowed to use the resource to enhance their real-life practice with more efficient patient visits (saving everyone time and money), as well as build their reputation and attract new patients. A Web-based interactive anthology will provide psychologists, economists, anthropologists, sociologists and other scientists with the latest research methods and tools to address emerging challenges in public health, such as the obesity epidemic and the rise of chronic diseases such as heart disease. 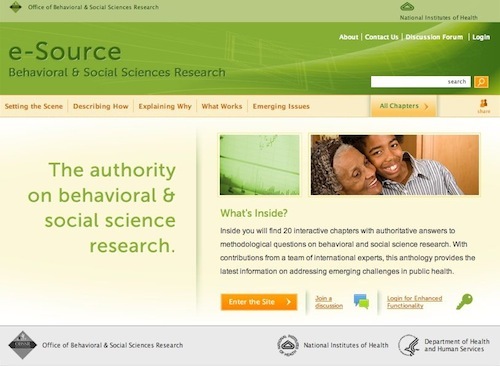 The Office of Behavioral and Social Sciences Research (OBSSR) at the National Institutes of Health collaborated with New England Research Institutes to create the free resource, called e-Source.